Enjoying a prime beachfront position on Fraser Island's east coast, Eurong Beach Resort offers a great range of affordable accommodation within driving distance to all the major attractions including Central Station, Lake McKenzie and Eli Creek. Accommodation at Eurong Beach Resort features both Resort Hotel Rooms and Apartments. Apartments feature full kitchen facilities and overlook the gardens and 75 Mile Beach. Eurong Beach Resort is renowned as being located on one of the most spectacular beaches in Queensland and features an excellent range of onsite facilities including 2 swimming pools, a bar and restaurant, BBQ area, tennis court, bakery, general store and more. 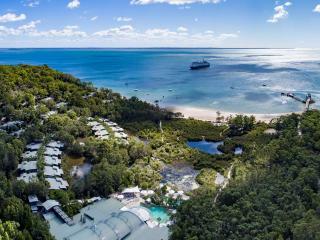 Eurong Beach Resort is the ideal place to base yourself for your next 4WD family holiday to Fraser Island. Accommodation at Eurong Beach Resort offers Resort Hotel Rooms and 2 Bedroom Apartments. Resort Hotel Room: Bedding is 1 Double Bed + 1 Single Bed. Maximum room capacity is 3 Adults & Children. Superior Hotel Room: Bedding is 1 Double Bed + 1 Single Bed. Maximum room capacity is 3 Adults & Children. 2 Bedroom Apartment: Features full kitchen facilities, large living areas and decks or balconies. Bedding is 1 Double Bed + 2 Single Beds. Maximum room capacity is 4 Adults & Children. Superior 2 Bedroom Apartment: Features full kitchen facilities, air conditioning, large living areas and decks or balconies. Bedding is 1 Double Bed + 2 Single Beds. Maximum room capacity is 4 Adults & Children. MacKenzie's Restaurant: Enjoy buffet and a la carte meals overlooking the large free-form swimming pool. The Beach Bar: Is a great place to relax with a drink and enjoy entertainment that is featured most nights. Relax under the palms trees overlooking the beach or pool. Eurong Beach Resort is only accessible by 4WD. A barge transfer is required from River Heads or Inskip Point. Barge transfers are to be booked direct.